Santo Domingo Care Center was the initial starting point of the outreach ministry to needy children in this city. Having served in the Dominican Republic for several years and seeing the need to educate needy children in Santo Domingo, a Kids Alive missionary and her Dominican husband pioneered a work to reach out to the children that flocked to them every day. Originally in a rented house, the center is now moving into a recently constructed three-story building. In 2016, the program served 120 children every day, in partnership with local schools. Plans are in place to convert to a full-day Christian school by the summer of 2017. Eventually, our program could grow to serve over 250 at-risk youth who are living in impoverished, dangerous neighborhoods. We also have a popular after-school soccer program with 50 regular participants. 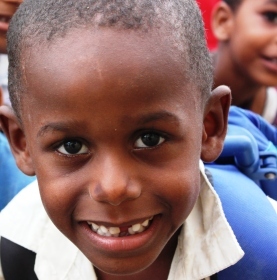 We praise God for all these opportunities to show His love to the children of Santo Domingo! Support the Ministry of Santo Domingo Care Center with Your Gift Today.